After breakfast we have full day city sightseeing tour of Delhi visiting Red Fort, Jama Masjid, Humayun's Tomb, Safdarjang Tomb, Hazrat Nizamuddin Auliya, Lodhi Tomb and Qutub Minar. Return to hotel for overnight stay. Red Fort: The Red sandstone walls of the massive Red Fort (Lal Qila) rise 33 m above the clamour of Old Delhi is one of the most magnificent places in the world. The Fort was built by Mughal emperor Shah Jahan in 1838 is a reminder of the magnificent power and pomp of the Mughal emperors. Lahore gate, the main gate of Red Fort attracts a major crowd on each Independence Day. Jama Masjid: This great mosque of Old Delhi is the largest in India, with a courtyard capable of holding 25,000 devotees. The highly decorative mosque has three great gates, four towers and two 40 m high minarets constructed of strips of red sandstone and white marble. Humayun’s Tomb: This magnificent garden tomb is the first substantial example of Mughal architecture in India. It was built by Bega Begam in 1565 AD, around nine year later of demise of her husband Humayun. Safdarjang Tomb: This is the last enclosed garden tomb in Delhi in the tradition of Humayun's Tomb and was built in 1753 - 54 as mausoleum of Safdarjung, the viceroy of Awadh under the Mughal Emperor, Muhammed Shah. Hazarat Nizamuddin Auliya: The Tomb represent to the one of the greatest and most influential Sufi saint of Indian Sub-continent, by whose order Hazrat Amir Khusro (R.a) Invented a new language to break down barriers between south and north India (Including Pakistan, Bhutan, Nepal, Rangoon, Bangladesh and border area of Afghanistan), for better understanding and to serve Humanity in a unified way. 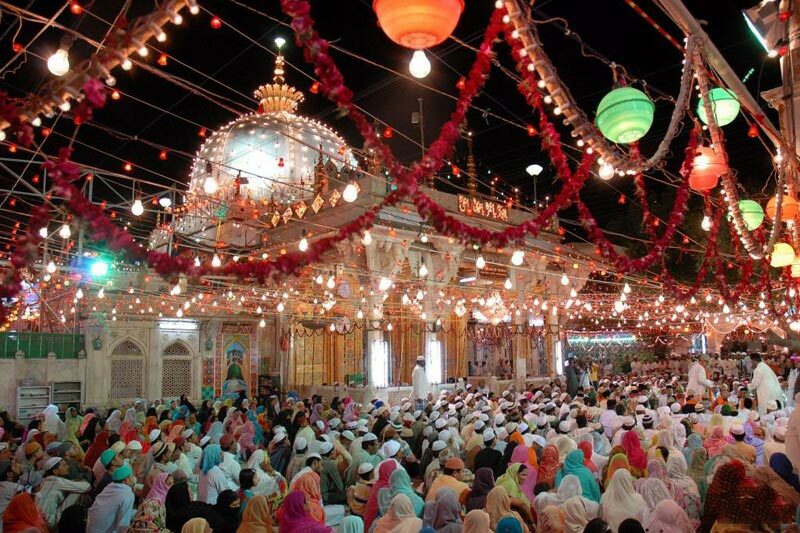 Hazarat Nizamuddin was a Sufi far beyond the boundation of time, caste, creed, color, region or race. Lodhi Tomb: The tombs of Muhammad Shah and Sikandar Lodhi are the good examples of octagonal tombs. Shish and Bara Gumbad are square tombs with imposing dome, turrets on corners and facades giving false impression of being double storied. Qutub Minar: Qutub Minar is built by Qutub-ud-din Aibak as a victory tower immediately after the defeat of Delhi's last Hindu kingdom. This soaring, 73 m high tower has five distinct storeys, each marked by a projecting balcony and tapers from a 15 m diameter at the base to just 2.5 m at the top. A 7 m high iron pillar stands in the courtyard of the mosque. It is said that if you can encircle it with your hands while standing with your back to it your wish will be fulfilled. Morning transfer to the railway station to board the Shatabdi train for Ajmer. Upon arrival at Ajmer railway station meet with our representative and transfer to the hotel. After fresh-n-up we will visit Dargah Sharif, Adhai Din Ka Jhonpra, Ana Sagar Lake etc. Overnight stay at hotel. 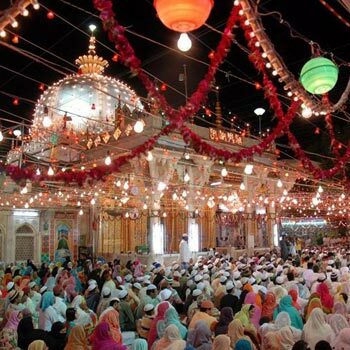 Dargah Sharif: The shrine of Khwaja Moinuddin Chishti. In 1256 AD, at the age of 114, the saint entered his cell to pray in seclusion for six days after which he passed away. It is now a sacred centre of pilgrimage. Devotees of all sects and faiths come here as the saint’s blessings. Each year, the followers of the master congregate here from all parts of the world on the occasion of the annual festival of Urs to pay their obeisance to seek the Saint’s blessings for fulfillment of wishes. Adhai Din Ka Jhonpra: A mosque originally an ancient Sanskrit College & within a temple enclosure. Proceed to Emperor Akbar’s Royal Palace made of red sand stone - housing a museum with a rich collection of Mughul & Rajput armour. This is a masterpiece of Indo - Islamic architecture. It is a relic of an old mosque consisting of a quadrangle with a front screen wall of seven pointed arches. Ana Sagar Lake: Ana Sagar lake is an artificial lake and named after Anaji Chauhan. This morning we will opt for an excursion to the massive fort of Amber, located 11 km from the city. One can also ascend the fort in an Elephant back. The Amber Fort was built by Raja Shri Maan Singh JI Saheb in 16th century. Maan Singh, one of the first war chiefs or the trusted general of the Emperor Akbar. Later we will drive to Agra. En-route to Agra we will stop to visit Fatehpur Sikri, the Mosque built by Emperor Akbar in the memory of Sheikh Salim Chisti. Further continue drive to Agra. Upon arrival check into the hotel. Overnight stay at hotel. Today we will visit the famous Taj Mahal at dawn. Taj Mahal was built by Mughal Emperor Shah Jahan as a memorial to his queen Mumtaz Mahal, made out of white marble took 22 years to complete (1630-1652 AD). After visit we will return to the hotel for fresh-n-up and breakfast. After breakfast we will visit the Agra fort, built by Akbar in 1565 as a military establishment. The Fort was made by red sandstone. During the reign of Shah Jahan it was partially converted into a palace. Further we will Itimad-ud-Daulah's Tomb or Baby Taj, this exquisite marble tomb was made by Emperor Jahangir's queen, Nur Jahan, in the memory of her father Mirza Ghiyas Beg during 1622-1628 A.D. Built entirely in white marble and inlaid with semi-precious stones, this mausoleum on the bank of the Yamuna River, exhibits a strong Persian influence. Later in the afternoon drive to Delhi, en-route we will visit Sikandra, the mausoleum of Emperor Akbar. It represents his philosophy and secular outlook, combining the best of Hindu and Muslim architectures in a superlative fusion. Completed in 1613 A.D. Further continue drive to Delhi. Upon arrival check into the hotel. Overnight stay at hotel.